Nothing can be said with certainty regarding monastic life in Byzantine Boeotia during the first eight centuries AD. We know that until around the mid 6th century Boeotia, as well as the rest of south Greece, had been largely Christianized, but soon passed to an unprecedented cultural decline: violent incursions by Avars and Slavs in the hinterland, the settlement of new populations, the frantic activity of Arab pirates in the Aegean, the overthrow of political and economic order of Late Antiquity, natural disasters and pestilence turned over everything. In the year 805 the Peloponnese was separated from the theme of Hellas, while Thebes became capital of a new, smaller theme of Hellas. Around the middle and the end of the 9th century, Byzantine governors or the region’s great land-owners financed the building of new churches, surely not by following the grandeur of early Christian basilicas, yet still in a certain impressive form. These were the first monuments of Christian Boeotia from the middle Byzantine period: the Church of Saint Gregory at Thebes (872) and that of the Theotokos of Skripou (Orchomenos) of the year 874. Although these churches seem to initially have functioned as chapels of rich land-owners, at a certain period of time they may have turned into the katholikon of urban monasteries. Within the aforementioned framework someone wonders: where is the organized monastic life? Unfortunately we have no clear and cross-checked testimonies for eponymous monasteries in 9th-century Boeotia. It is, however, known that within the climate of a renewed optimism marked by the Macedonian dynasty and the end of the Iconoclasm Controversy, ecclesiastical life and monasticism rose everywhere once again. From the Life of Hosios Loukas (whose information we should use slightly in retrospective) we learn that in the beginning of the 10th century there were rural coenobitic monasteries in Boeotia and Attica, although Hosios Loukas himself preferred the anchoritic life. More precisely, we learn that in close proximity to the town of Thebes there was a monastery with its abbot called Anthony, where Hosios Loukas was often offered hospitality. However, 9th-century Boeotian monasticism was rather more anchoritic. From this anchorite monasticism would gradually emerge the coenobitic one. And it is Hosios Loukas who became the link from the one form of monasticism to the other. He was both an anchorite and a cenobite. As a mater of fact, Hosios Loukas himself after 946 retreated and led a coenobitic monastic life where today still lays the homonymous monastery, until his death in 953. The first and most popular monastic community of Boeotia was created here ever since. In the second half of the 10th century it would attract the interest of Boeotian landed aristocracy as well that of the Byzantine emperors themselves and would turn into a major center of worship and pilgrimage. In the Μonastery of Hosios Loukas at Steiri in Boeotia hundreds of local and refugee monks would come and lead here a monastic life, such as the unknown Saint Luke Gournikiotes, whose portrait is found in the katholikon of Hosios Loukas. Most of all, however, here would come the scions of powerful landowning families from the thematic capital, Thebes, to change their secular power with the monastic one, such as the Leovachos family. At the same time, and in a parallel way, political and military thematic officers would fund the erection of a splendid monastic complex and would endow it with donations from rural or urban revenues. The second most crucial influence for the development of indigenous monasticism was exercised by the presence of Hosios Nikon Metanoeite in Thebes (around 970). Hosios Nikon taught in the city and led a monastic life probably in some isolated hermitage, maybe even in the Monastery of Hagia Photeine, for whose veneration he showed special preference. We may assume that since then a close bond was created between him and the abbots of the Monastery of Hosios Loukas, and thus explaining his mosaic depiction in the katholikon of the monastery as early as the beginnings of the 11th century, just a few years after his death! Therefore, with the beginning of the second millennium, Boeotian monasticism, centered around the Monastery of Hosios Loukas, experienced its high peak. And the centuries to come would prove an era of expansion and complete efflorescence of monastic life in Boeotia with whatever that entailed. The new period was marked by the grandiose projects of the abbots of Hosios Loukas: the erection of an imperial church next to that of the Theotokos / Santa Barbara. Actually, modern research almost agrees that in the year 1011 the erection of the famous katholikon of the current monastery started thanks both to imperial and local donations. It seems that a rapid development of this pilgrimage center and the subsequent wealth brought to the monastery provoked state care and the ambitions of local aristocracy. The monastery’s fame (mid 11th century) started expanding in the entire south Greece, new donations were added to the older ones, while subordinate monasteries arose: at Thebes the female Monastery of Archangel Michael or of the Naupaktitissai, near Orchomenos Saint Nicholas at Kambia, other ones at Aliveri and Politika of Euboea, as well at Antikyra and elsewhere. This prosperous monastic climate of the mid 11th century as well the economic rise of the region attracted the interest of the Byzantine court. A new missionary was sent upon imperial order: Hosios Meletios the Young. He settled in the unknown Monastery of Saint George, very close to Thebes, and attracted many believers and monks near him. But under the burden of his rapid popularity he was forced to resettle at Mount Kithairon, where he created a huge monastic center with twenty-four paralavria and many hundreds of monks! Thus, a new complex of monasteries, centered around the older Monastery of Symboulou, would flourish here in the second half of the 11th century thanks to the generosity of Emperor Alexios I and the irresistible spiritual influence of its founder. After his death (1105) this complex continued his activity with equally active young abbots and would become a center of economic and spiritual strength until the occupation of the region by the crusaders of the Fourth Crusade. Hosios Clement of Sagmata started his ascetic life at the end of the 11th century at the monastic complex of Hosios Meletios. He was dispatched, however, from the coenobitic life and lived as a hermit on Mount Ypaton or Sagmata, near Thebes. 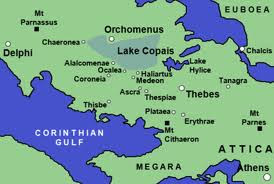 There, later, along with his pupils he settled in a small monastery, over the remains of the temple of Jupiter Hypatos. Thus, in the beginnings of the 12th century a new monastic center was founded in Boeotia. With the support of the local population as well the favor of the Komnenos family (although the surviving chrysobull with the donations of Manuel Komnenos has been checked as a forgery) flourished during the entire 12th century. For Hosios Niketas of Thebes (12th c.) we know a few things. He led an ascetic life as a hermit initially in SW Boeotia (at Osteia, mod. Chostia and later at Kalamiotissa, mod. Zaltsa) and developed charitable work in the region. Besides, during the same period at Davleia another group of monks founded the Monastery of Jerusalem or the Transfiguration of the Savior, a spiritual foundation renowned and active mostly in the following periods of the region’s history. For the period of Frankish occupation we can only make reasonable assumptions. We know, however, that the Monastery of Hosios Loukas passed to the possession of the Templars’ Order, while that of Hosios Meletios remained in Orthodox hands, as revealed by the correspondence between the exiled Michael Choniates and Abbot Joannikios. As far as the rest of the monasteries are concerned, we assume that the few Catholic monks would not have been in position to exploit their huge estates, and thus left them to their owners and just collected the revenues. Finally, the political dimension of monasticism explains its rise during this particular period of time. Large and small monastic complexes like those of Hosios Loukas at Helikon, Hosios Meletios the Young at Kithairon, Hosios Clement at Mount Sagmata, the Transfiguration of the Savior or of Jerusalem at Davleia, the smaller ones around Thebes or their dependencies in the area of Livadeia and the steep shores of the Corinthian or the Euboean gulfs, were indisputable footholds of Byzantine authority. The man of everyday labor with his long- or short-distance pilgrimage journeys had the chance to escape from the misery of his everyday life inside their walls and to be influenced by the splendor of their ceremonies, but also to strengthen his Christianization and Hellenization. To seek for and find someday the cure for his spiritual or physical weaknesses. To feel that he belonged to an all-powerful entity on earth (the Byzantine Empire) and to seek for an after-death salvation. Through the monasteries and Orthodox worship, which monasteries passionately served, the various populations of a region became members of a commonwealth. Thus, the political role of monasticism was equally important with the spiritual and the economic one. And a last question: How literate were the monks of those days? We know that Hosios Loukas, the founder of Boeotian monasticism, was completely illiterate and actually he did so consciously. He did not want to be educated. Hosios Loukas’ example, however, was not followed by his successors. The following abbots were literate, rich landowners as it appears from various grave or wall inscriptions with their names as well from the statute of the Theotokos Naupaktiotissa which was perhaps composed in this monastery in 1048. Besides, the other two founders of Boeotian monasticism, Nikon Metanoeite and Hosios Meletios, were literate, imperial envoys with proper education. In any case, however, no theological treaty or other type of document survives from the hand of the leaders of Boeotian monasticism. But the conclusion, in general, is still valid: the 11th and 12th centuries were a period of efflorescence for Boeotian monasticism thanks to the dominant political and economic position of the region as well as to the charismatic leaders of this social phenomenon.